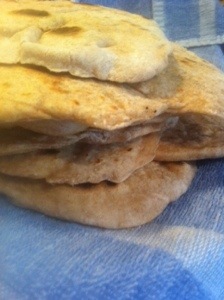 I have some hummus in the refrigerator, but no pitas or pita chips, so of course, I had to remedy that. And since I can’t go shopping because I’m watching the kids, I thought I’d make some. Let me tell you, they are hard to stop eating. Here’s my recipe that I adapted from one that I found in a Greek cooking book. I put the liquids and the salt in the loaf pan, then the flours, made a well and put the yeast in the well. I put it on the dough cycle. I originally used one cup of water, but when I checked on it mixing, I decided that wasn’t enough, so I added another cup. I think that I probably could have used another half cup of water because the dough was a bit crusty in some parts at the end of the cycle. I cut the dough into 12 pieces and rolled them out – the thinner the better. 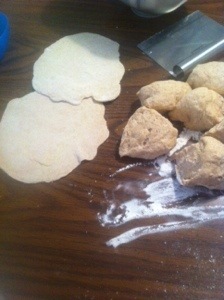 Make sure you have enough flour so that the dough doesn’t stick to the table. It doesn’t take a lot, but don’t forget about it – that gets messy. 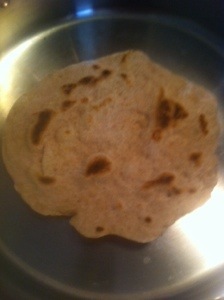 To cook, put a dry pan on medium high heat, when it’s hot, place a round of dough in the pan. In 30 seconds or so, flip it over, cook for 1-2 minutes on that side, it should pop up in some places. Then flip it over again and cook for a minute. While you’re cooking the rest of them, store them in between a clean dishtowel. It’ll keep them warm. Try not to eat all of them at once.